I hope everyone had a safe and fun Halloween, we sure did! 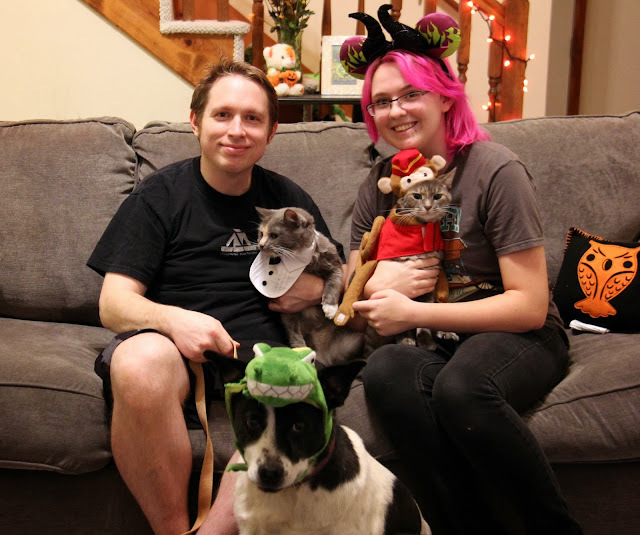 This was our 2nd Halloween at the house (1st for our dog Moo) and we had so much fun passing out candy!! Just like last Christmas I thought it would be cute to get a family picture of all of us, none of the animals wanted to cooperate but we ended up getting a few good ones. Mack is holding Boots, I'm holding Canary and the fierce dragon at the bottom is Moo!